Adjustable comb conversion. Not available at the moment. We are currently NOT TAKING IN guns for adjustable comb conversions while we try to clear some of the existing backlog of work. An adjustable comb conversion done in our workshop being tested. The comb is the top surface of the stock , and is the section of wood that makes contact with the underneath of a shooters cheekbone when a shotgun is correctly mounted. Making sure that the comb is in the correct position is arguably the most important part of fitting a shotgun. 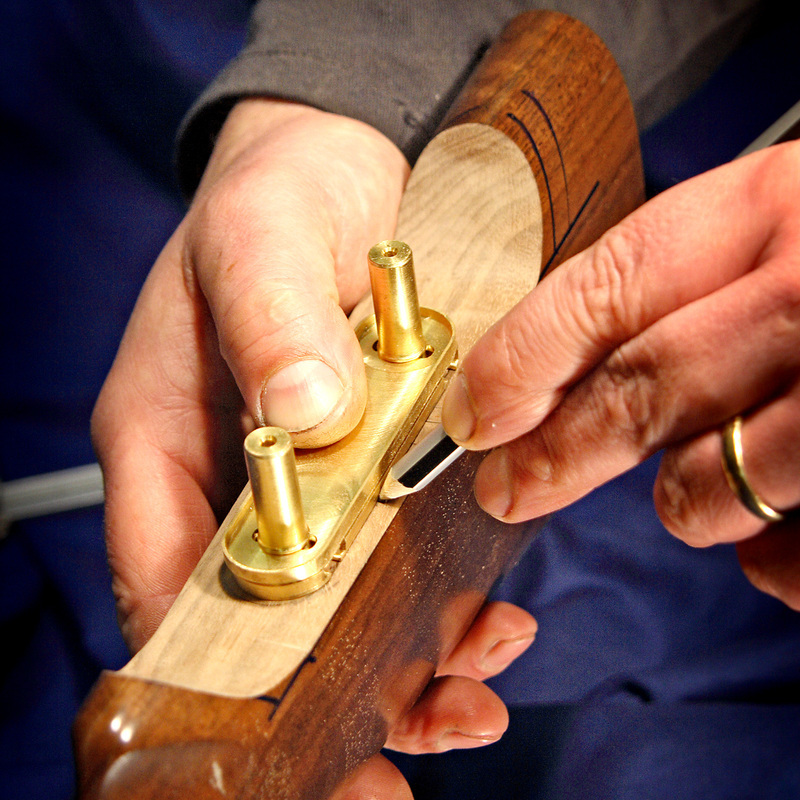 Positioning the comb accurately for both height and cast is critical in allowing the shooter to mount the gun correctly and to obtain the optimum shot placement. An adjustable comb makes this process easier. Adjustable combs are frequently fitted to obtain a comb position that can not achieved with a particular gun by the more usual casting techniques, or when the shooter wants to be able to alter the comb position for shooting different disciplines with the same gun. The gun being worked on below is one where after assessing the stock fit using our Laser Gunfitting System we realised that the comb was too low for the client to mount properly and that we were not going to be able to obtain the degree of lift required by casting or reheading the stock. Various options were considered and in this case the option that appeared most suitable was to fit an adjustable comb conversion. After careful measurement of the stock recess and stock bolt tunnel the layout lines are marked. Then the stock is placed in a special jig and transferred to the band saw for the first cutting operation. You may notice that I terminate the adjustable section behind the recess for the thumb muscle of the grip hand. I do this as I believe this thumb should be fully supported by the stock as an aid to maintaining a good control of the gun, especially during recoil. Once the comb section has been removed I can mark out the position for inletting the adjusment mechanism. In this instance I am fitting one of my favourite brass comb units. I like these units as they offer a good range of movement, are easy to work with, and the brass just looks so right when the job is finished. Here we see the adjustable comb hardware fitted into the stock, with the adjustment posts in position and the recess polished and oil finished. We make our own comb hardware now and this gives us more options and allows us to tailor the system to match the gun. We even have a kit for the Beretta 20 bore. Now the adjustment collars and central memory post have been fitted to the moveable section of the comb, and it is time to put the stock back together. I think that looks like a nice tidy job and the customer should be very happy. The final part of this job was to get the client back so that we could complete the fitting session by correctly setting up the comb for him. We make many different adjustable combs. These fall into two categories. Adjustable for height only and fully adjustable for height and cast, both types come with calibrated posts and memory collars. This allows for measured adjustment and an easy return to a previous setting. We usually fit the posts so that they go down into the stock which allows us to use longer posts, giving a greater range of adjustment. This is useful if you really need a lot of lift, for instance if you want to try one of the raised rib kits. f you know your requirements you can send us just the stock (this means just the wood not the action as well) and we can convert it to adjustable comb and send it back to you. If you are not sure what you need it is best to book a fitting session first. The UK firearms regulations prevent us from sending the action or barrels of a gun to a private certificate holder via any courier, this needs to be face to face. If you cannot remove the action from the wood you can still send the gun to us, but you would need to pick it up in person, or we can send it back to you via your local gun shop. If you collect in person we can help you set up the comb height, and you can have a cup of tea. COMB CONVERSIONS NOT AVAILABLE AT THE MOMENT.